Michael Burke attended Recruit Training at Marine Corps Recruit Depot, San Diego, California, in May of 1992. Graduating as a Private First Class in July of 1992, he attended the School Of Infantry with an MOS of 0311. PFC Burke then reported to Charlie Company, First Battalion, Third Marines, Kaneohe Bay, Hawaii. During that time he held the billets of Team Leader and Squad Leader. Corporal Burke reported to Marine Security Guard Battalion, Quantico, Virginia in January of 1995. Upon graduation in February 1995 he was assigned as a Marine Security Guard to American Embassy Bujumbura, Burundi. In April of 1996 Corporal Burke was assigned to American Embassy Madrid, Spain. In June of 1997 Sergeant Burke was assigned as Assistant Detachment Commander to American Embassy, Dublin, Ireland. Sergeant Burke reenlisted in 1998 with a lateral move to 5711 Nuclear Biological Defense Specialist. In April of 1998 he reported to NBC Platoon, H&S Co, H&S Battalion, 2d FSSG. During that period he was assigned as an instructor at MARFORLANT NBC School and as plt sgt for NBC Plt. Sergeant Burke then reported to 2d Maintenance Battalion, 2d FSSG as the Battalion NBC Chief in September of 1999. Staff Sergeant Burke reported to 3d Reconnaissance Battalion as NBC Chief in November of 2000. During this period Staff Sergeant Burke deployed with the battalion in a number of operations including Tandem Thrust, Ulchi Focus Lens, Yama Sukura, and KITP. His additional duties included schools and training chief, battalion MCMAP instructor, Tactical Tracking Operations Instructor, PMI, and Recon Operations Center Watch Chief. In February of 2004 Gunnery Sergeant Burke reported to G-3 NBC Plt, 3d Marine Division. There he was assigned the billets of G-3 Platoon Sgt and NBC Platoon Sergeant. As part of the G-3 and in support of the MCAMP Far East school, Gunnery Sergeant Burke participated in Ulchi Focus Lens, Khan Quest, and a number of martial arts exchanges with the Japanese Self Defense Forces in Fukuoka, Japan. Gunnery Sergeant Burke reported to the Chemical Biological Incident Response Force, Indian Head, Maryland in January of 2005 and was assigned as plt sgt to Decontamination Platoon, REACT Company. In August of 2005 Gunnery Sergeant Burke was assigned as Company Gunnery Sergeant for REACT Company. In 2006 REACT Co was split into two companies and Gunnery Sergeant Burke was assigned as Company Gunnery Sergeant for Alpha Company. During his time at CBIRF GySgt Burke participated in a number of exercises and real world operations including two State of the Union Addresses, President Gerald Ford’s State Funeral, two deployments to the Defense Research and Development Canada training facility, Operation RESCEUR/MEDEUR in the Republic of Georgia, NBC International Conference, numerous command visits by foreign military VIPs, multi-agency exercises Capital Shield and Ardent Sentry. In 2006 Gunnery Sergeant Burke received the Navy and Marine Corps Leadership Award. First Sergeant Burke reported to 3d Battalion, 3d Marines in March of 2007 and was assigned to Kilo Company. The battalion deployed in support of Operation Iraqi Freedom 08-06.2 from August 2007 through February 2008 where they operated in the Karmah and Zaidon areas under RCT 6 and RCT 1. 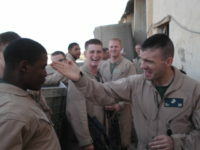 In June 2008 First Sergeant Burke was assigned to Headquarters and Service Company and deployed to Operation Iraqi Freedom with 3d Battalion 3d Marines as part of Task Force Military Police in Al Asad, Iraq. 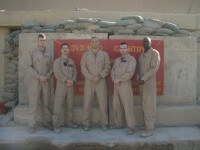 In January of 2010, First Sergeant Burke reported to Fleet Anti Terrorism Security Team (FAST) Company in Bahrain. During a time of unprecedented unrest in 2010 and 2011, FAST Company deployed platoons to reinforce State Department facilities at American Embassy Bishkek, Kyrgyzstan, American Embassy Cairo, Egypt, American Embassy Manama, Bahrain, and American Embassy Sana’a, Yemen. In March 2012, First Sergeant Burke was promoted to Sergeant Major. 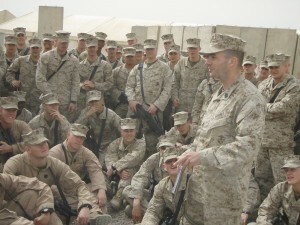 In May of 2012 Sergeant Major Burke reported to Inspector and Instructor duty at 3d Battalion, 25th Marines in Brook Park, Ohio where he currently serves. Michael Burke’s personal awards include the Navy and Marine Corps Commendation Medal with gold stars in lieu of second and third awards, the Combat Action Ribbon, and the Good Conduct medal with a silver star in lieu of a fifth award. He is married to Heather Burke.